This entry was posted in Racing on June 20, 2012 by Steve Tilford. 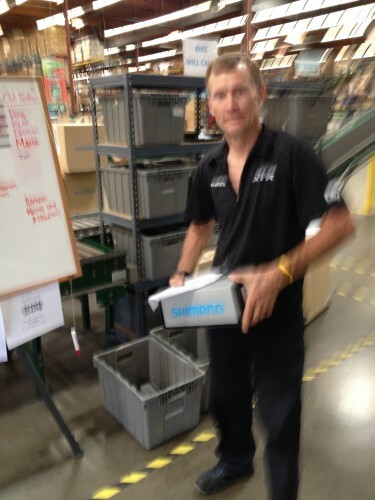 I went up to Shimano and visited Wayne Stetina and the gang up there. It is always super enjoyable catching up with Wayne. He’s a pretty smart guy that sometimes has a different perspective on subjects than me, which makes me think more about my perspective. Anyway, as usual, I was drooling over the new stuff, which I don’t have. 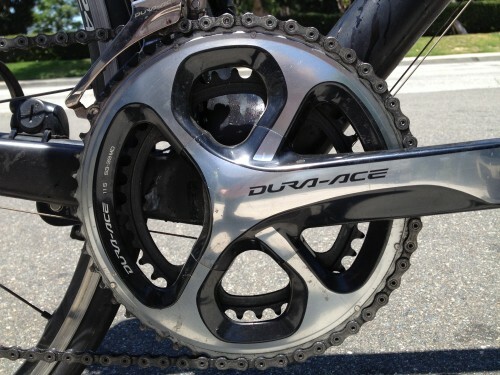 I rode Wayne’s bike which was equipped with a 11 speed Dura-Ace mechanical group. It was unreal. The shifting and braking power is substantially better than anything they’ve ever produced. By miles. You can pretty much shift with your little finger. It was so easy to shift, I originally thought I was riding electronic shifting. The front derailleur will shift from the small ring to the big under full pressure easily. The best thing about the whole thing, and the reason I think it all works so well, is that they have some new, super slick cables that really reduces the friction in both the brakes and derailleurs. That is going to be an easy upgrade for all groups, no matter what you’re riding. Wayne says he has close to 3K on the cables, and chain, and it worked incredibly well. Better than any new parts I’ve ever ridden. I didn’t manage to make it out of there with the new parts, but I got some shoes, wheels, super slick cables, and best of all, hopefully on a list that is going to get some of these parts, sooner, rather than later. It is really amazing how much the technology of the components have improved the last few years. It really is a fun part of the sport, if you’re into the mechanical aspect. I met up and rode with my friend, Greg Demgen yesterday. He’s the guy in the Nevada City photo below. I’ve known Greg since I was 14. He drove down to Lawrence Kansas, from LaCrosse, Wis, for nearly the first race I ever did, and beat up on me. So, it is getting close to 40 years of riding with Greg. Pretty cool. He’s doing good. 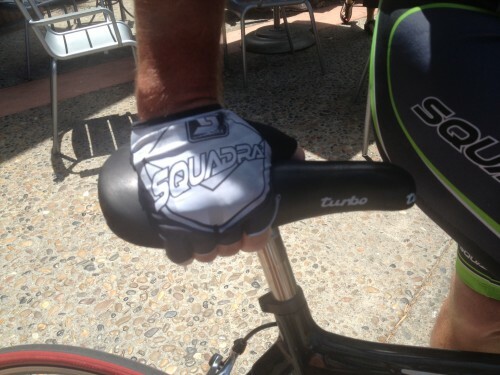 He works for Squadra, custom cycling clothing, but is really a chauffeur for his son, Chris, who is an awesome baseball player and seems to practice more hours than I ride my bike a week. Anyway, it was nice catching up some. So, I’m flying back to Kansas later this afternoon. I know it is just about the first day of summer, but it already came to Eastern Kansas. The temperatures have been in the upper 90’s all week and it doesn’t look like they are going to go down anytime soon. The Tour of Kansas City historically has super hot temperatures, so this will be the norm. I’m going to suffer like a dog. Wayne isn't in the office that much. Even when he is, he's on the phone a bunch. The new cranks might look a little unorthadox, but they make a ton of sense from an engineering perspective. Wayne, after special ordering me some shoes. Not the best photo, but he is super light right now. Really skinny. I'm not sure how he does it being on the road so much. 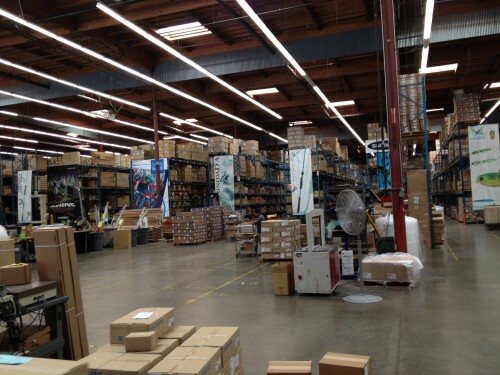 The Shimano warehouse is huge and very impressive. Here is Greg's saddle, an old Turbo. He stock piled them, realizing it was his favorite saddle of all time. I was riding South along the coast highway and my friend, Brent Prenzlow, was riding North, pulled a u-turn and rode with me for awhile. 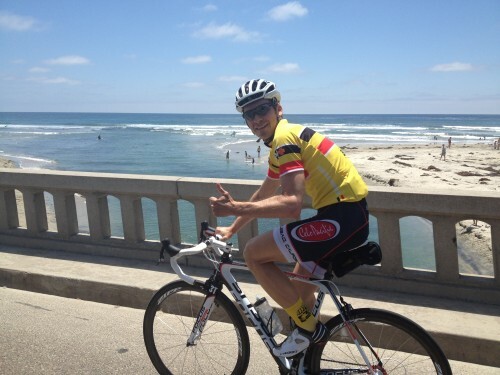 He is wearing the winner’s jersey from the Waffle Ride/Race, from back in April. What if you had a full race 1975 road bike and kit next to a full race 2012 road bike and kit, what would be the first part you would switch out? The 2nd, 3rd, 4th etc? Would anything from the old bike and kit survive?” (in the winter, maybe wool jersey?) would it. Would it be different for racing versus training? Maybe fuel for another blog topic …..
Fast riders from Lacrosse who would have thought. Sounds as if your shoulder is felling better, time to start logging miles and miles in the heat. Do you know if the product you rode was from the mass-production line or engineering/production samples? There tends to be a substantial difference between what’s produced for engineering/marketing and what’s sold. Either way, it sounds like fun. Please be aware Shimano does not guarantee superior mechanical functionality when paired with the Andy bike. Saw a pic of the new 11 speed hubs. Black ain’t right for DA. 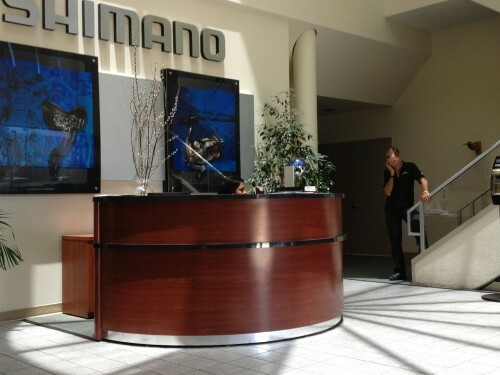 Top of the line Shimano is like driving a Porsche compared to a Chevy. You get what you pay for. Looks like Brent had a spill from the bandages on his left knee. Shimano also makes my favorite fishing reels.